Description Logic (DL) Class Expression Learning (CEL) is a recent research topic of interest in the field of machine learning. Given a set of positive and negative examples of individuals in an ontology, the learning problem consists of finding a new class expression or concept such that most of the positive examples are instances of that concept, whereas the negatives examples are not. Therefore, the class expression learning can be seen as a search process in the space of concepts. In this chapter, the use of CEL algorithms is proposed as a tool to find the class expression that describes as much of the instances of positive documents as possible, being the main novelty of the proposal that the ontology is focused on inferring knowledge at syntactic level to determine the orientation of opinion. Furthermore, the use of CEL algorithms can be an alternative to complement other types of classifiers for sentiment analysis, incorporating such description classes as relevant new features into the knowledge base. To do so, an ontology-based text model for the representation of text documents is presented. 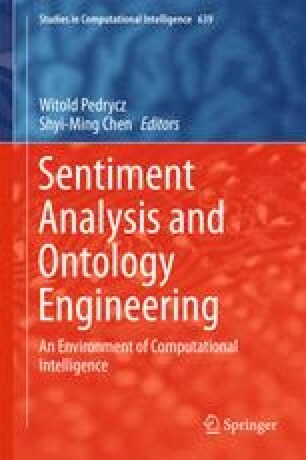 The process for the ontology population and the use of the class expression learning of sentiment concepts are also described. To show the usefulness and effectiveness of our proposal, we use a set of documents about positive feedback focused on films to learn the positive sentiment concept and to classify the documents, comparing the results obtained against the result obtained by a C4.5 decision tree classifier, using the standard bag of words structure. Finally, we describe the problems that have arisen and solutions that have been adopted in our proposal.